UPDATE 8 a.m., THURSDAY, JULY 14 – Northwest Ecuador was struck by 5.9- and 6.2-magnitude earthquakes on July 10, near Muisne and Quininde, both in the province of Esmeraldas. With movement felt as far as 30 miles away, the quakes caused further damage with reports of one death and 22 injuries. Nearly 80 newly displaced residents sought refuge in shelters after the two earthquakes, with more expected in the coming days. Nearly 100 residents showed signs of trauma and severe anxiety. Heifer Ecuador is actively working in Esmeraldas to help farmers with reconstruction. Since the April 16 earthquake, 2,159 aftershocks have been felt, particularly in the Esmeraldas and Manabi provinces of Ecuador. Prior to the most recent earthquakes, reconstruction efforts began May 15 to rebuild cacao storage facilities in Calceta and Quiroga, in the Manabí province. The work has enabled 918 families to sustain their income by continuing to sell cacao. Construction crews built new walls, installed electricity and plumbing, and repaired fencing around the facilities. Both storage centers are operating at full capacity. We also began rebuilding 20 houses, and repairing 40, in the Libertador Bolívar commune in the Santa Elena province. A community group of earthquake victims was organized with the goal of using shared resources to benefit more residents in hopes of helping more families. Crews rebuild the cacao storage center in Calceta as part of the reconstruction projects in the Manabí province. In the two most affected provinces, 21,823 people experienced job loss, which has caused a surge in the country’s unemployment level. Markets and commercial areas were completely destroyed in Calceta, Portoviejo, Manta and Pedernales, with the hardest hit residents being producers and merchants. The economy has slowed in rural areas with food products facing marketing challenges. Also, the earthquake intensified existing problems, particularly the local water shortage. Underground wells farmers depend on for irrigation have been damaged by salt water and others have dried up completely. We have held meetings with local residents to determine the best way to speed up the reconstruction process. By partnering with other organizations in the area, we are working to restore the economic activities of nearly 1,500 families in more than 20 communities in the provinces of Manabí and Esmeraldas. Since the majority of residents make their income from producing and selling food products, we made the following suggestions for the greatest impact. 1. Reactivate small, informal restaurants and markets selling food products. Construct units to sell foods made from plantains and traditional dishes by training families in food management and administration with the support of local authorities, universities and organizations. 2. Reconstruct housing and production means for small farms. Rebuild houses in the Rocafuerte and Muisne provinces and provide assistance in diversifying seasonal crops and cacao. 3. Assist small businesses for women and youth. Help women’s groups start or improve weaving and embroidering businesses, small variety stores and grocery stores. Offer credits through a revolving loan fund so access to financial resources will be readily available. Work with community tourism initiatives and workshops to allow youth an opportunity to make artisan goods. 4. Offer psychological and social support. Assist nearly 300 children living in shelters in Esmeraldas by teaching them ways to relax and strengthening the cultural identity of the communities. The estimated cost of the reconstruction proposal is $800,000 to bring facilities up to technical standards. Also, we want to establish more equitable and sustainable commercial channels for these communities that are rich in culture and identity, nature, and gastronomy. Our main goal is to support the recovery and reconstruction process to reestablish livelihoods of the families affected by the earthquakes. Earthquakes, floods, hurricanes and mudslides devastate communities. Though we cannot predict where the next disaster will strike, we stand with Heifer communities around the world to rebuild for the long-term. Heifer’s disaster rehabilitation fund empowers communities to transition from meeting basic needs to more self-sufficient practices like livestock husbandry, planting and harvesting crops and rebuilding infrastructure and livelihoods. You can take action to help families rebuild by giving here. UPDATE: 4 p.m., FRIDAY, APRIL 29 – Heifer Ecuador continues to focus on meeting the immediate needs of project participants affected by the April 16 earthquake. A total of 140 rations of food, water, toiletries; six tents; and three first-aid kits have been distributed to those in the communities of Muisne, Calceta and Manabi. With a death toll of more than 500, many participants fear further damage from aftershocks. The integrity of houses continues to be compromised with each temblor following the 7.8-magnititude earthquake. 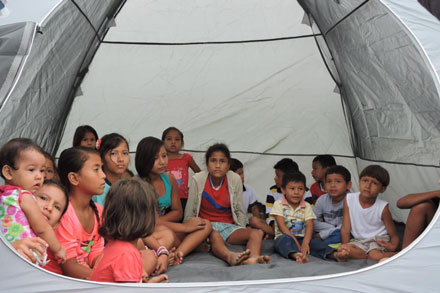 Children taking refuge in a tent distributed by Heifer Ecuador. About 70 children, disabled, and senior adults in Muisne have been displaced and need shelter. Plastic shelters are serving as a temporary fix, yet recent rainfall is weakening the structures. To prevent stagnant pools of water from forming, the Heifer team is working to build community shelters that will redirect the rain and prevent disease from forming. Teams are asking for and collecting canvas for tents, plastic, strings, nails and awnings. The greatest need is sanitary products and health items to promote the well-being of participants. Heifer teams are in need of antibiotic ointment, bug repellent, cream for rashes, Vitamin C, fever-reducing medicine for children and diabetic medication. Sanitary products including chlorine, gloves, antiseptic gel and rechargeable batteries are also needed. Additionally, the team needs craft items like cardboard, paint, crayons and scissors for periods of playtime with the children. You can help our farmers recover from this devastating disaster. Please give today. UPDATE: 10:30 a.m., FRIDAY, APRIL 22—Relief efforts continue in Ecuador, where more than 500 people were killed by last weekend’s earthquake. Heifer International’s team in Ecuador spent this week assessing damage and delivering aid supplies to the communities where we work. Help Ecuador and other Heifer communities in need recover from natural disasters with a donation today. UPDATE: 2 p.m., WEDNESDAY, APRIL 20—Silvana Gonzalez, a communication officer for Heifer Ecuador, shared this report at noon on April 20. Wilmer Dominguez and Franklin Eusebio, Heifer Ecuador technicians from the Dry Forest project, were welcomed with open arms as they arrived in the Santa Elena province on the coast of Ecuador. They delivered 660 gallons of water and canned food to a Heifer partner organization in Calceta, a city in the Manabi province. Members of the FdV (Fortaleza del Valle) cooperative here grow fine organic cacao. This organization is made up of 930 families who gather and produce by hand the best cacao in Ecuador. The leaders of the FdV organization were awaiting their arrival. The first thing to do was to unload the boxes of food. Everyone pitched in to help. The food was distributed to the most needy families in the cooperative. Berto Zambrano, the manager of the cooperative, was clearly heartbroken as he recounted the experience. On Saturday evening, he saw the buildings of Calceta fall just a few meters from where he was standing. He estimates 70 percent of the buildings in Calceta cannot be used again. “It was like a movie,” he said. In Bolivar, also in the Manabi province, there have been 30 deaths so far. FdV cooperative members have been trying to monitor the families of this area, but the very remote areas have been difficult to reach because access is nearly impossible. Currently there are no registered fatalities of cooperative members here, but there have been many material losses. The FdV cooperative’s collection center suffered severe damage. Several walls are cracked and the cacao fermentation area is practically destroyed. The pole that was holding up the light transformer fell and was destroyed on impact, which is why they have not had any electricity until this morning. But the electricity comes and goes. Heifer Ecuador will make the immediate purchase of a new light transformer and will repair the exterior walls to prevent vandalism. The people are afraid, sad and nostalgic. The earth won’t quit shaking. During this trying time, one tremor puts everyone on alert. Lidia, the administrator of the FdV cooperative, and Jessica, the promoter, said with a bit of fear that in spite of everything, the worst is over. So far, there have been 407 aftershocks. Jessica and Lidia have been coordinating the delivery of provisions to the community. Clean water is still largely unavailable and it is so difficult to see the people in the streets begging for water from every car that passes by. For this reason, Heifer Ecuador is providing four water purification systems for the families of this region. The team will also distribute 1,000 water barrels of 5.2 gallons each to the families. In Calceta, the hospital building is damaged and the few shops in the area have been closed for fear of looting. Calceta, a small coastal city, is in a state of emergency. There are many needs to be met, and the people will not rest until they have overcome this. What can we do for them? UPDATE: 9 a.m., WEDNESDAY, APRIL 20—Heifer Ecuador began distributing water on Tuesday to communities in need after last weekend's earthquake, while other supplies like tents, food and items for children were being packed and readied for distribution. Boxes packed with supplies are readied for families in Esmeraldas. More than 2,500 gallons of water, which Heifer identified as the most urgent need, were delivered to families in Fortaleza del Valle, an area where our farmers produce cocoa. The other supplies were planned for Muisne and the Esmereldas area. Heifer Ecuador said support was also coming from unexpected places. Project participants living in Ecuador's moors and highlands who were unaffected by the earthquake are acting in solidarity with their counterparts along the coast and in other regions where the quake did significant damage. "The communities of Cumbijín, Sacha and Zuleta, gather supplies to send to the companions of the projects on the coast," Heifer Ecuador said. Heifer teams mobilized Monday to assess the damage and coordinate relief efforts, and have been working on the scene since then. Heifer Ecuador plans to help 900 families in Fortaleza del Valle and 300 families in Muisne. Heifer project participants in Manabi, Calceta and Fortaleza del Valle are also facing substantial property damage and a lack of basic services. Cacao farming shows great potential in these communities, and once immediate dangers are past, Heifer will work to rebuild irrigation systems, crop processing units and storage facilities. Once immediate needs for survival are met, Heifer Ecuador will help affected families rebuild. The area is still being rocked by significant aftershocks, the most recent on Wednesday morning registered as a 6.1 temblor. You can ensure our farmers recover from this devastating quake. Please give today. UPDATE: 11 a.m., TUESDAY, APRIL 19—Heifer Ecuador is providing food, water and shelter to displaced residents of the coastal villages devastated by last weekend’s powerful earthquake. Once immediate needs for survival are met, Heifer Ecuador will help affected families rebuild. The death toll from the 7.8 quake is estimated to be more than 400 people, with more than 2,500 injured. Initial assessments indicate that Heifer staff and project participants are all safe. A first look at the damage in the communities where Heifer works in Ecuador. Nearly all the homes were damaged in the village of Santa Rosa. Families' belongings were strewn in streets following the earthquake. The inside of a home in the village of Santa Rosa following the 7.8 earthquake in Ecuador. The epicenter of Saturday’s quake was 16 miles from Muisne, and the mayor of the community reports that at least 300 houses were destroyed. Wooden houses resting on stilts in the tidal areas toppled into the sand, and concrete buildings further inland crumbled into the streets. The entire community has been evacuated. Electricity and clean water are no longer available in Muisne, and are also difficult to access at temporary shelter. Heifer projects in Muisne aim to restore endangered mangroves and help fishing families tap new sources of income as their catches dwindle. A map from the USGS shows how intensely parts of Ecuador felt the earthquake that struck late Saturday. The areas in the orange felt it "very strongly." Other areas could not feel the temblor as intensely. earthquake forced the evacuation of the entire population and razed the village of Santa Rosa, where Heifer project participants were living. Two assessment teams from Heifer were moving into Calceta, Manabi, and Muisne Monday. With the new information, Heifer Ecuador said they will now approach support there differently. "With this information, we can arm ourselves better and provide a more focused support," the team said in a report to headquarters. "In this initial support, also, we will send emergency help, because unfortunately, the help has been centered in other areas and very little in Muisne." Help Heifer communities in the face of disaster. Saturday's earthquake was the strongest to hit the South American nation in decades, and has injured more than 2,500 people. Until today, information specific to our project communities had proved difficult to understand due to the lack of electricity and disrupted telephone services. News outlets both in the United States and in Ecuador say the damage is significant and widespread. Once the assessment teams are in place, they plan to coordinate efforts with Ecuador's Ministry of Agriculture and other crisis response groups to develop a situation profile with rapid and appropriate post-crises actions and mid- and long-term solutions. The earthquake had an epicenter about 16 miles from Muisne, an area where Heifer is actively working to help farmers restore the mangroves. The other areas strongly impacted were Manabi, Calceta, and Fortaleza del Valle, said Rosa Rodriguez, Heifer Ecuador's country director. So far, all Heifer staff and beneficiaries are reported safe. UPDATE: 4:30 p.m. SUNDAY, APRIL 17 — Heifer Ecuador will dispatch two teams to move into the zones most heavily affected by Saturday's 7.8-magnitude earthquake. Both teams planned to travel Monday with one team going to the zone of Calceta, Manabi, while the other will go to Muisne. Information specific to our project communities has been difficult to access due to the lack of electricity and disrupted telephone services, Heifer Ecuador reported late Sunday. Still, reports from the areas in which we work indicate significant damage. According to a local newspaper, Diario La Hora, approximately 80 percent of the households in the district of Bolivar (Calceta) have structural damage, while in Muisne many famlies were being moved to shelters because of the damage there. Once in place, teams will coordinate efforts with Ecuador's Ministry of Agriculture and other crisis response groups to help define the situation better and develop a situation profile with rapid and appropriate post-crises actions and mid- and long-term solutions. The earthquake had an epicenter about 16 miles from Muisne, an area where Heifer is actively working to help farmers restore the mangroves. The other areas strongly impacted were Manabi, Calceta, and Fortaleza del Valle, said Rosa Rodriguez, Heifer Ecuador's country director. So far, all Heifer staff and beneficiaries are reported safe, as are the areas around Quito, where we also have programming. During natural disasters, Heifer works alongside relief organizations to provide support and help our farmers recover. Continue checking here for updates and news of our projects as information becomes available. Flora Cagua-Gamez in January 2014 as she gathered shellfish in an estuary along the Muisne River. UPDATE: 11 a.m. SUNDAY, APRIL 17— Heifer beneficiaries in the Muisne and Manabi areas of Ecuador have suffered damage to their homes, and many are without electricity, food and water after a 7.8-magnitude earthquake shook the South American nation late Saturday night. "Muisne in delicate situation. There is no loss of life of families that we support," Heifer Ecuador reported on their Facebook page. Rosa Rodriguez, country director for Heifer Ecuador, said they will continue to monitor the emergency and report more information as it becomes available. The quake had an epicenter about 16 miles from Muisne, an area where Heifer is actively working to help farmers restore the mangroves. The other areas strongly impacted were Manabi, Calceta, and Fortaleza del Valle, Rodriguez said. So far, all Heifer staff and beneficiaries are reported safe, as are the areas around Quito, where we also have programming. Rodriguez said the coastal towns received an order to evacuate because of a threat of a tsunami, but many people returned around 1 a.m., as the government indicated the tsunami threat had passed. Many news outlets are reporting that roads are blocked from debris, making it difficult for emergency crews to get to the affected areas. Families living in the coastal mangrove region are promoting community tourism and traditional fishing. Read more about our project work there. During natural disasters, Heifer works alongside relief organizations to provide support and help our farmers recover. We will be updating here with news of our projects as information comes in. 8:30 a.m SUNDAY, APRIL 17—Two provinces in Ecuador where Heifer conducts project work were heavily impacted by a 7.8-magnitude earthquake that shook the central coast of the South American nation late Saturday night, said Rosa Rodriguez, country director for Heifer Ecuador. Heifer staff is mobilizing to assess safety of families as well as determine damage or losses. The quake had an epicenter about 16 miles from Muisne, an area where Heifer is actively working to help farmers restore the mangroves. The other areas strongly impacted were Manabi, Calceta, and Fortaleza del Valle, Rodriguez said. So far all Heifer staff are reported safe, as are the areas around Quito, where we also have programming. Rodriguez said the coastal towns received an order to evacuate because of a threat of a tsunami, but many people returned around 1 a.m., as the government indicated the tsunami threat had passed. "The families at the coast area, all of them stayed at the highest areas, and recently started to return to their homes," Rodriguez said. Families living in the coastal mangrove region are promoting community tourism and traditional fishing. During natural disasters, Heifer works alongside relief organizations to provide support and help our farmers recover. We will be updating here with news of our projects as information comes in.